It’s been a frustrating $1/$2 session for our Hero today – few cards worth playing, few chances to get involved. Then, from the big blind, the dealer deals him a six, and then another six. A pocket pair – not great, but at least worth seeing a flop…for once. Hero flopped his set! Finally, a good hand. He checks out of the blind, and the original raiser announces “all in”. Hero is a bit shocked by this action, but then he looks over to the stack that villain has slid out to the center – it’s only $35. Villain started the hand with only $50, something Hero didn’t notice until now. He calls the all-in, of course, and his hand holds up vs. villain’s ace-king. A good result for Hero, but he shouldn’t be happy how this hand was played, because he made a HUGE mistake preflop. A more observant player would have realized that he can’t profitably call a raise with a small pair against a 25 big blind stack. And good players take pride in playing well, not playing poorly and getting lucky. This winning hand actually increases Hero’s level of frustration instead of quelling it. Two hands later, on the button, Hero checks his cards again and finds Ace-Queen, both diamonds. Another hand worth playing, and twice in the same orbit to boot. Once again he follows the action around the table. One fold, a raise from the second position, and then a three-bet from one of the retired rocks that frequents the cardroom. Hero can’t believe his luck, again. Finally a decent hand to play, and the septuagenarian nit looks like he likes his hand. His frustration ticks up another notch. Then, an idea. “Maybe I could turn my hand into a bluff”, Hero thinks. “Maybe I can push him off ace-king, tens, jacks, or even queens”. “My hand is suited and I have two blockers”, he thinks. Yeah, this could work. “All in”, Hero announces. The first raiser gets out of the way, and the old nit beats Hero’s chips into the pot, flipping over two black aces. Hero gets stacked. An unavoidable cooler? A decent, aggressive play that just happened to run into the top of someone’s range? Or was it bad poker? How about the first hand? There’s no excuse really for failing to notice your opponent’s stack size before deciding on your action. In truth, both of these hands suffer from the same mistake, one that’s immediately and quickly correctable. Go back and read the hand histories again. Can you spot the common mistake made in each of the two hands? Here’s the mistake – in both hands, the hero made decisions about his situation before the action got to him. In the first, he found a small pocket pair and decided he finally had a hand worth playing. This decision was made before his short-stacked opponent was even in the pot, and this pre-made decision distracted him from stop paying close attention to the action. When then action got to him, he followed through on his pre-made decision, which turned out to be a poor one based on the actual conditions facing him. The same thing happened on the second hand. Hero finds Ace-Queen suited on the button, usually a good situation. But this situation changes pretty drastically after the retired rock 3bets, and the happy feelings of finally getting dealt a good hand flip into frustration. And this frustration leads to a desperate, hopeless bluff against an opponent who isn’t folding against a 4bet anywhere near enough of the time. If you define “tilt” as allowing your emotions to control your decision making process at the poker table, then you can see that the hero was tilting in both hands. He saw his cards and was pleased about being dealt playable hands, and then made mistakes with this hands based on these feelings. The second hand is the more obvious example of tilt – the pleased feeling of seeing Ace-Queen suited gets flipped over to frustration, and this frustration helps leads to getting stacked. But the first hand is a form of tilt, also. Hero’s pleasure of finding a small pocket pair in his hand made him stop following the action closely, and this caused him to make a preflop mistake. It shouldn’t be too hard to see a very easy solution to getting rid of this form of tilt at the table. Stop looking at your cards before it’s your turn to act. You’ve probably heard this advice before, maybe in the context of paying closer attention to the action, giving yourself a chance to look for some tells, and avoiding giving away tells yourself. Those reasons are all good ones, but the most important reason is because it stops you from making decisions before having all the relevant information coming to you. Let’s revisit both of the hands above with this simple change. Hero is in the big blind. He watches the action, a few folds, a limp, then a raise to $15. Hero sees villain only has $35 (hopefully, he notices this time, now that he’s not focused on his hand), and starts to think of what ranges he should be facing this opponent. Hero decides that he will 3bet and get it in with pocket nines and above, ace-queen and ace-king, based on what he knows about this opponent. With pocket aces, it might be profitable to actually flat and then get it in on any flop, depending on what the limper might do. Hero knows he can’t flat any other hand profitably with this small effective stack. When action gets to Hero, he looks down at pocket sixes. Close, but no cigar. Hero folds. Two hands later, Hero is on the button. Action before him starts with a raise from early position, and then a 3bet from the retired rock – the first hand he’s played in 2 hours, and the first 3bet all day. Aces or kings only, hero thinks. This guy is much more likely to flat with ace-king, queens and jacks. When it’s Hero’s turn he checks his cards and finds Ace-Queen suited. A nice hand, but not against the nit’s range (not to mention there’s still an EP raiser to act after him). Hero folds. You can see how not looking at our cards helps us in hands. 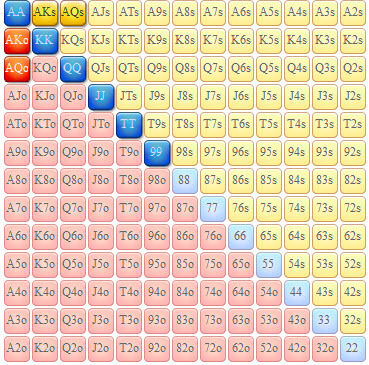 Not only do we avoid getting frustrated about seeing a playable hand and then having to fold it, but we give ourselves time to formulate what range of hands we could and should be playing against opponents based on the action. If we then see a hand that falls out of these ranges, we can more easily make the best decision. Matt Tagliaferri is a freelance writer and poker player located in Cleveland, Ohio. Make sure to follow him on Twitter!